Reader Fran Jackson is looking for any information or legal documents that might exist about a sixth great grandfather who served time and was later released and settled in Albemarle County, Virginia. Fighting on the losing side in the Revolutionary War. The answer may not be quite what Fran is hoping for… but at least this time nobody can blame the Yankees for burning these court records! 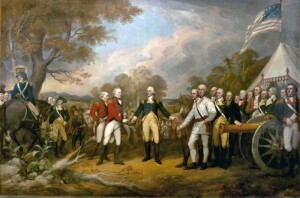 In the fight over whether the British would allow the descriptive lists, the Continental Congress scrapped the whole deal.5 And what that meant for the men captured at Saratoga was a long and arduous captivity in New England, Virginia and Pennsylvania in what were among the very first prisoner of war camps ever built on American soil. So… what records are we looking for here, and where might they be? Let’s start with what Fran knows. Her ancestor was imprisoned at the camp near Charlottesville, in Albemarle County, Virginia, and settled there after the war. If specific court records were ever created in Albemarle County with respect to her ancestor or other individual prisoners during the years between the prison camp’s start in 1779 and the time the men were marched out of Virginia in 1781, Fran can “thank” her ancestor’s compatriots for the fact that those records no longer exist. Ouch. No records of paroles or indentures or anything else that might have been recorded in the court documents survived those bonfires. Fortunately, most of the Albemarle County records generally and the court records after 1783 do exist at the Library of Virginia,13 and interlibrary loan of microfilm is an easy matter.14 Since Fran’s ancestor settled in the county, it’s entirely likely that he will appear in the county records that do exist — he may have taken an oath of allegiance or sought naturalization in the county court; he may have married or bought land or left a will; he would surely have paid taxes. Even if he didn’t, and no Albemarle records can be found, Fran surely won’t let that stop her from doing the general research to put this man into his proper perspective. Even if it isn’t possible to find records about this particular person and his particular experience, it’s almost always possible to find records about people who had similar experiences in the same time and same place to help give context to an ancestor’s life. First off, the bulk of the records on the Convention Army are most likely at the National Archives in Washington, D.C., in Record Group 360, Records of the Continental and Confederation Congresses and the Constitutional Convention, 1765 – 1821. There are published indices to some of those records (the Papers of the Continental Congress, compiled 1774 – 1789), that a good library should have.15 In Fran’s shoes, I’d definitely be hunting for the descriptive lists made of Burgoyne’s men, if they still exist — what a joy it would be to find an ancestor’s name and description on those lists! There are also papers of General Horatio Gates, 1760-1804, held by the Manuscripts and Archives Division at the New York Public Library.16 Among the 1.5 linear feet of holdings at the Library are Gates’ correspondence and his orderly books for the period of his engagement with Burgoyne and his troops. Don’t overlook papers by Burgoyne. Ronald Gephart’s bibliography of works as to Revolutionary America17 should also be in a nearby good library and lists a handful of diaries and orderly books that might be useful, including Burgoyne’s orderly book, edited by E. B. O’Callaghan in 1860 as part of the New York State Archives Documents series. What a fun question… We want to know what you find, Fran! Thank you for an interesting and informative article. Just last week I was researching some of my own Loyalist ancestors that were held as POWs during the revolution. I found this record from the National Archives on Fold3 that may be interesting for those with Pennsylvania Loyalist connections. It is part of the “Papers of the Continental Congress” collection, which is available and searchable for free. A quick search of the collection shows several records pertaining to Gen. Burgoyne and Col. Tarleton as well. Nice find, Douglas! That set of Papers is part of Record Group 360, and well worth a careful look for anyone researching this time period. If such a list exists, I would like to check it for the name of my 3rd g-grandfather who supposedly was a grenadier in a flank company of the 31st Regiment under Burgoyne. Dale, I haven’t been able to determine definitively if the lists exist. But if they do, they’d most likely be in the National Archives in Washington, D.C., in Record Group 360, Records of the Continental and Confederation Congresses and the Constitutional Convention, 1765 – 1821. There are published indices to some of those records (the Papers of the Continental Congress, compiled 1774 – 1789), that are referenced in footnote 15. If you follow up, please let us know what you find! This is so helpful and thank you! I have an ancestor who was one of the British escapees from Cambridge who settled in Princeton, MA and took an oath of allegiance in 1780. He was an illiterate soldier, as he made his mark of allegiance, rather than sign his name. We are trying to track down what Regiment he would have been in, not an easy task in America. I did see somewhere (!) that the Descriptive Lists of soldiers did not start until after the Rev War. Glad this was helpful. Good luck! I grew up in the Charlottesville area,and have an ancestor who guarded the Convention army prisoners.Security was very lax,many packed their bags and became citizens after the war.I’ve heard stories of old cabins being dismantled and Hessian buttons being found in the chinking.Fredrika von Reidesel,wife of the German commander characterized the Virginians as “indolent ,because of the heat,but ready to dance at the drop of a hat.”She and her husband were entertained by Jefferson at Monticello,Jefferson playing fiddle with German officers,with Fredricka calling the dance figures.The officers were repatriated after the war,but many Hessians chose to stay. Reidesel’s journey from Canada into NY and all the aforementioned details are given in a book called “Memoirs and Letters and Journals of Maj. Gen. Riedesel” by Max von Eelking. It’s a free ebook on google books. The original descendent of my family was a Muskateer in his Brunswick Regt. I’m currently trying to connect the dots however as to his exact route from Saratoga to Augusta Co., Va.